Today is Day 16. The collective can be read here. I am joining The Nester for the remainder of October with other 31 Dayer’s . It has crippled in seasons of waiting for a husband to return, after a season of separation, marked the days dark and long. Tried to wrangle all life out of the days of healing, to rename me the one whose husband left. Fear says failure and brokenness rather than Hope and Security. Today I am joining the lovely Nacole at Six In The Sticks. 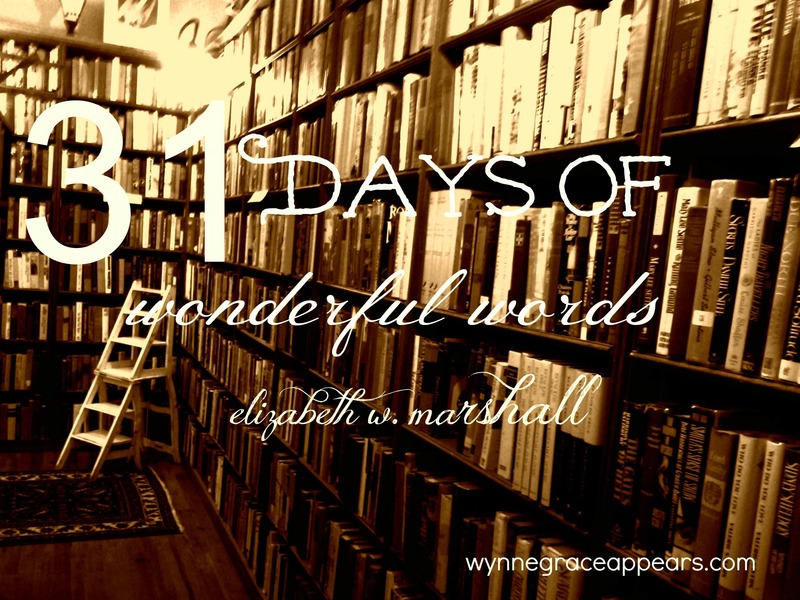 She is writing on fear for 31 Days at The Nester. You can read more of her hope-filled writing there. And I will not let fear cripple my attempts to workout the technical glitches to guest post there. Still Hopeful. See you at Nacole’s, but still here. Thank you for adding to the conversation by adding your beautiful words to the discussion. You bring so much more when your words are apart of this community. Oh dear Amy, you…Yes life lived out in His outstretched arms. Free and freer everyday. He is a Freedom Fighter, no? He is a Chain Breaker, no? Love that He fights for us to be free….celebrating freedom with you. I believe that, most of the time, calling out fear by its name takes its power away. I lived in a world of fear for far too long, too. It takes real strength the break those chains and not live governed by the paralyzing fear. This was beautiful. Thanks for sharing. Sherry, yes looking at it, staring it down with an honest stare down. Right, Honestly admitting it.Then He breaks those chains. His redemptive work is beautiful. And oh that we wouldn’t live a day in fear.And oh that we would run into His hope filled arms. I grieve at the thought of the fear that paralyzes for my sisters. Oh but freedom waits. In my greatest fears…I have seen God pout more grace and hope than this heart can say in words. God did not give us a spirit of timidity, but a spirit of power, of love and of self-discipline. 2 Timothy 1:7 Let us chew and swallow that truth so that it nourishes our soul. Blessings to you friend. Love your post. You bring such hope through this 2 Timothy passage. Yes, I have clung to this back in the days of deep fear. And now today it breathes fresh, I am chewing on His word and swallowing His truth, right with you sister. Yes to the hope He pours out in the middle of fear. Yes to His grace covering. Love that you are here. Oops, I meant God pour. Ah, yes, God pour. Your heart was known before you spoke it. Lovely blog and great series! Thanks for visiting me at Doorkeeper. Blessings! It was a pleasure visiting there. The journey is richer in community. I hope you will come again during this October series. I have met many and learned much. You bless! Much love to you Elizabeth. 🙂 This morning I have read much about fear and how God always shows up, His Presence and Light felt so strongly in the darkest times and places. I am just nodding and whispering “amen”. And hoping to see you again. Seeing you here is a rich blessing. This series is more joyful with a community of pilgrims. Oops, that was for another. Oh friend I hear your amens and I too have read much recently about fear. Its a sacred echo to my soul. Your smile, radiant, casts a light of hope and shines bright on trembling fear, my friend. Oh yeah! That’s what I’m talkin about! Every fear has no place at the sound of Your great name . . .
Kelli, oh your precious face here and words to boot, fill me up with the happy. Yes, yes, fear has no place. So today, I am choosing JOY. And hoping to hang tight to it. There is an army of women kicking fear soundly to the curb. Let’s join and wrestle fear to the mat, and take the fire from the belly of fear, anxiety and worry. YES? Your wise words here are comfort to my soul. I am humbled you have friends in the adoption process that may find something of comfort in this post. And that you are sharing, I know they desire and need to be surrounded by those that understand, who can comfort them in the waiting. Glad they have you DAF. you bless me with your words. thank you. Continuing to pray for you and yours. Thanks for your continued prayer and for speaking and writing and just being a part of this community. Love to you. Yes, perfect love casts out fear. I want it cast as far from me as possible. It is a robber of joy. Thank you for allowing me to partner with you. I am to the moon thinking of how many copies of your book will rest in the hands of the broken. And those desirous of hope. You make my life richer, em.